The tunneling boring machine (TBM) that is digging the first of the twin tunnels for the Regional Connector project in DTLA broke through to the Grand Ave/Bunker Hills Station at 2nd/Hope a little before 11 a.m. Thursday. The machine — known as ‘Angeli’ — was lowered into the ground near the Little Tokyo/Arts District Station at 1st and Central last winter and began digging the tunnels in early February. In late April the tunnel boring machine completed digging through the Historic Broadway Station at 2nd and Broadway on its way to 2nd Place and Hope. Following today’s breakthrough, the TBM will be repositioned inside the station box area to continue tunneling the remainder of the first tunnel to 4th Street and Flower. The TBM will then be taken apart and transported back to the 1st and Central Station site in Little Tokyo where it will be reassembled in order to begin mining the second tunnel. The $1.75-billion Regional Connector Transit Project is a 1.9-mile underground light-rail tunnel that will connect the Blue, Expo and Gold Lines in downtown Los Angeles and will include three new stations at 1st Street/Central Avenue, 2nd Street/ Broadway and 2nd Place/Hope Street. The project will reduce the need for light rail riders to transfer and speed up trips to and through DTLA. When complete in 2021, the Connector tunnels will allow Metro to run one light rail line between Azusa and Long Beach. 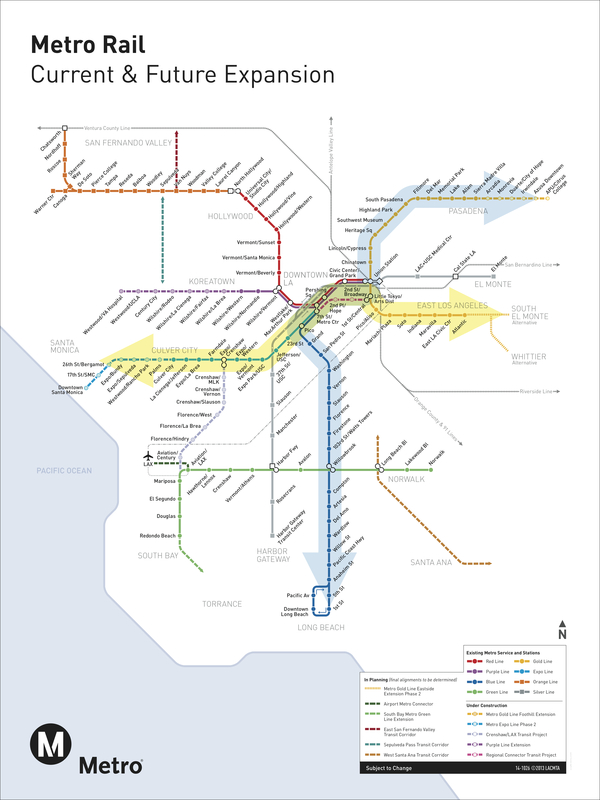 The other line will run between East Los Angeles and Santa Monica. The two lines will share five stations in DTLA: Pico, 7th/Metro and the three new underground stations being constructed as part of the Connector project. The TBM was manufactured in Germany by Herrenknecht AG. It weighs approximately 1,000 tons, is 400 feet long and is 21.6 feet in diameter. It has advanced about 70 feet per day on average. Completion of the twin 1.1-mile tunnels is expected in early 2018. To track the TBM’s progress, learn more about tunneling and enjoy the musings of a giant dirt-munching machine, follow Metro on Twitter at twitter.com/regionalTBM. For more information on the Regional Connector Transit Project, go to metro.net/regionalconnector. 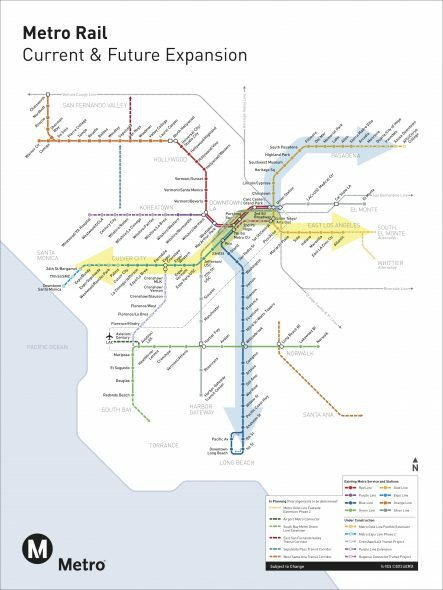 The Regional Connector is funded by Measure R, the transportation sales tax approved by L.A. County voters in 2008, and a grant from the Federal Transit Administration, among other sources. The full Metro news release with quotes lives here. Below are some pics from today’s break-through, also posted in this Flickr album of pics. Please feel free to use and share the images on your media site, blog and social media! Does anybody know why “The TBM will then be taken apart and transported back to the 1st and Central Station site in Little Tokyo where it will be reassembled in order to begin mining the second tunnel”? Wouldn’t it be more efficient instead to turn the machine around at 4th & Flower and then dig back to Little Tokyo? Because there’s no station box or tunnel yet at 4th & Flower in which the TBM could be turned around or taken apart and reassembled! I take these things weren’t designed to be put in reverse so they could back up to where they started. The circular blade certainly wouldn’t fit anymore, since the diameter of the tunnel is reduced by the concrete lining fitted to the walls. What is the reason that the cut and cover approach will be used south of 4th Street instead of the tunnel boring machine (TBM)? It’s a tricky area to use the TBM with all the existing buildings and other infrastructure there. The tunnel would be too narrow. keep in mind that as it cuts through, the tunnel’s walls are put in place and bolted in.